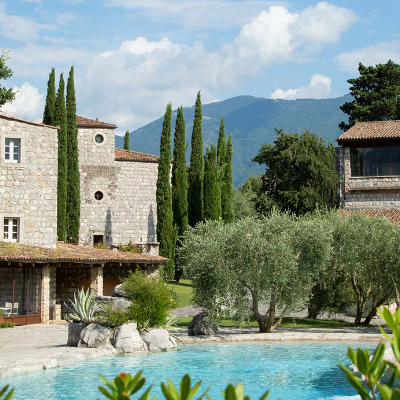 Aquapetra Resort & Spa can be found located in the mountainous region of Benevento, Italy. This stylish resort has been lovingly restored over the course of the last ten years and is situated in a wonderful location. You don’t have to travel far to find olive groves, vineyards, sweeping hillsides, hot springs, and a wealth of other natural beauty to explore. It’s hard to believe when you’re engulfed by the resort itself and surrounded by unspoiled countryside, but it’s only an hour drive from Naples and around two hours from Rome by car. However, with more than enough to do and see in this historic town, a short trip into the centre to explore the monuments and national parks should be on your short list. Much to the benefit of guests, art plays a big part at Aquapetra. Each year they select two artists to take residency at the resort and showcase their art. Along with displaying a number of other pieces throughout the hotel. Whether you have an interest in art or not, it’s hard to ignore some of the larger sculptures as you explore the hotel and surrounding grounds, and we found ourselves discussing many of the pieces as they caught our eye. 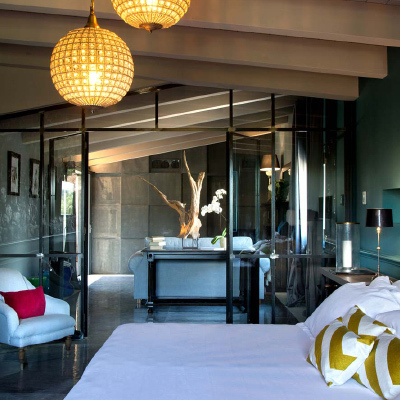 During our stay, we experience their latest completion, which is titled the Aquapetra Suite. This spacious suite is nothing short of impressive. The interior decor comprises of a deep turquoise colour, offset primarily with whites and gold touches. There are some intriguing art pieces, an abundance of trendy furniture, and much of the walls and flooring have been finished with stone quarried from nearby grounds. A floor-to-ceiling glass doorway separates the bedroom from the living area, allowing plenty of natural light to fill the suite and add to the spacious feeling. 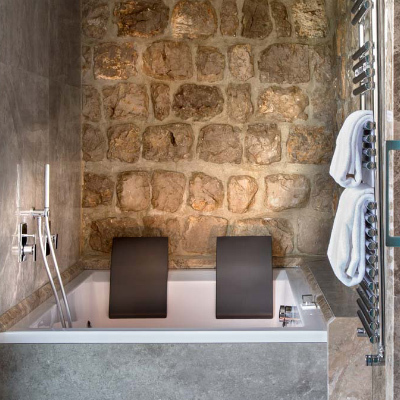 There are two bathrooms, the main bathroom is complete with a huge jacuzzi and rain shower, and finished with polished marble and more natural stone, the second bathroom is complete with a small walk-in shower, toilet and wash basin. 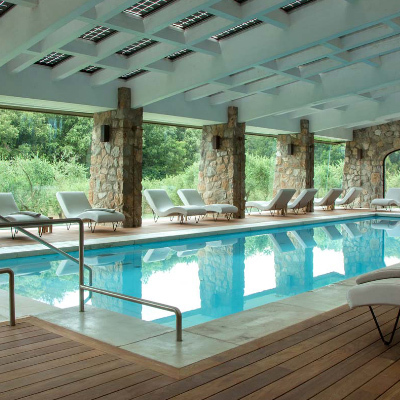 The spa facilities are a huge part of what makes the Aquapetra so special. With huge indoor and outdoor pools, sauna, steam room, and treatment rooms, you’ll find plenty of ways to spend your day relaxing and being pampered by their skilled therapists and making the most of their state-of-the-art equipment. 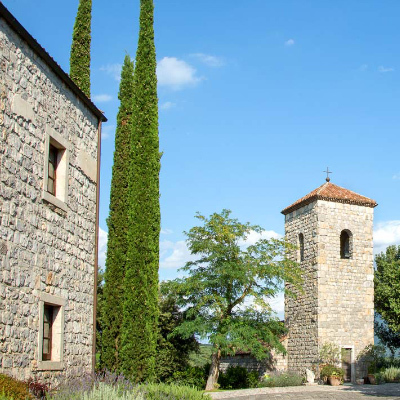 For dining, guests are treated to a Michelin star experience at Ristorante Locanda Del Borgo, where head chef Luciano Villani has crafted a menu that simply needs to be experienced. There is also a super trendy bar that’s a must start to your evening. With dim lighting, luxurious decor, and interesting pieces of art, the bar wouldn’t feel out of place amongst the private member’s clubs in London’s Soho. Eagle eye fans of the Channel 4 show First Dates, hosted by Maitre d’ Fred Sirieix, may have noticed some familiar sights. This is because Aquapetra is the resort where the last series was filmed, and it’s easy to understand why as the picturesque resort provides the perfect backdrop. 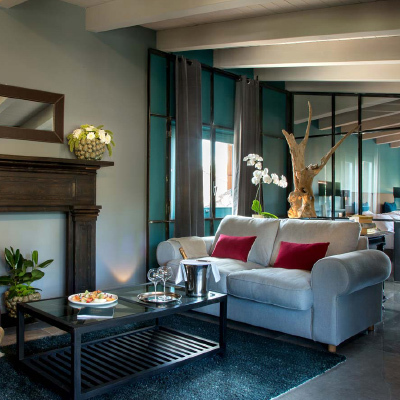 We thoroughly enjoyed our experience at the Aquapetra Resort & Spa. We left feeling relaxed and rejuvenated and were more than impressed with how well we were looked after and the facilities available.